At the end of 2014, Mars Hill Church closed down. Several ends were loose as MHC ceased to hold services. Mark Driscoll had left the church but there was much curiosity about the report prepared by his elders which called on him to step down and enter a plan of restoration. That report was never released. The status of the assets of MHC was also of interest to many members and ex-members. The plan was to distribute the remaining funds and proceeds from sales to 11 MHC video locations that became free standing churches. 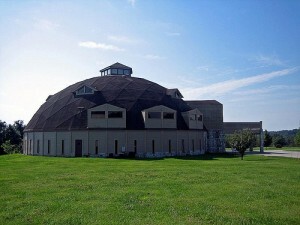 Nothing was explained to the public by remaining administrators Kerry Dodds and Caleb Walters. Recently, I have obtained the plans of dissolution for MHC and the MHC Foundation for Planting Churches as filed with the Attorney General’s office. 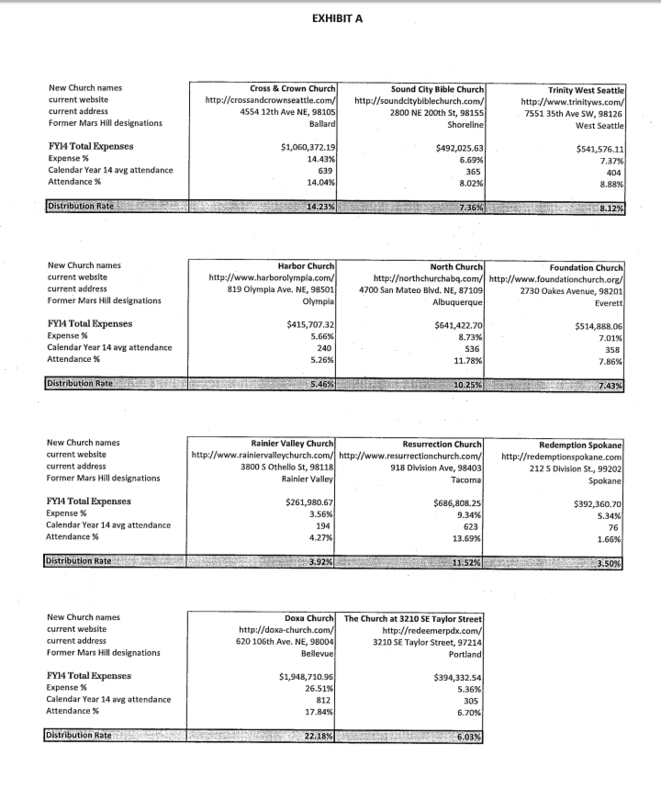 The latter was a trust on behalf of MHC and had $154,732 remaining in an account. After expenses, the proceeds of those funds went to an Indian mission, Visions Nationals, and the mission to Ethiopia, New Covenant Foundation. After these groups had been used to solicit funds for Mars Hill Global, it is nice to see them benefit. Although the plan doesn’t specify the amount of money involved, the assets were distributed according to financial and attendance numbers. Plan of Distribution. The Board hereby approves, authorizes, and consents to the voluntary dissolution of the Corporation, such dissolution to be effected in a reasonably expeditious manner but in no event later than June 30, 2016, and in accordance with the Plan set forth in this Agreement. It has been fascinating to watch the differences of perspective play out in the controversy over possible improper links between Donald Trump’s campaign and people associated with Vladimir Putin. Two illustrations follow. First, listen to Evelyn Farkas described her efforts to alert colleagues in the Obama administration about the need to preserve information pertinent to possible Trump collusion with Putin loyalists. Farkas didn’t say she or anyone spied on Trump. In the context of discussing Russian interference in our election, she said there was intelligence about possible connections between Trump’s staff and Russia. Farkas didn’t say how they got the information but she was clear that she didn’t want Trump’s people to keep it from seeing the light of day. Trump supporters are focusing on the possibility that Trump was being surveilled. However, what I think is much more important is the core of Farkas’ claim. She said intelligence exists which ties the Trump campaign in some manner to the Russians. Is the leaking of such information a problem or is it whistleblowing? Second, watch Speaker of the House Paul Ryan explain Devin Nunes’ decision to brief President Trump about information he received from a “whistleblower-type person.” Keep in mind that Nunes and the Republicans have been quite critical of those who have leaked intelligence to the press. Apparently, whistleblowing is fine but leaking is bad, even though one must leak to blow the whistle. Trump apologists see in Farkas’ words an admission of spying and vindication for Trump’s claims of being “wiretapped.” They seem more outraged about Trump surveillance than the possibility that Trump’s people colluded with Putin’s people. In contrast, if there was collusion between Trump and/or his campaign staff with the Russians, then I am glad the previous administration found out and preserved the intelligence. Apparently, it doesn’t matter what Trump does as long as he appoints judges acceptable to the religious right. Watch Robert Jeffress preach the Trump gospel. In response to my series of articles on the changes taking place at Mercury One, I have been contacted by Mercury One donors. Two such donors, now former donors, agreed to comment anonymously about the changes in focus and donation allocation policy. 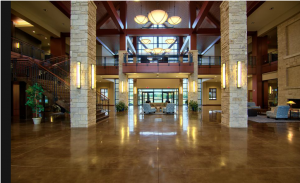 One source of frustration for the former donors is the lack of communication from Mercury One. Without my posts, these donors would not have become aware that the changes had been made. The former donors said, “We did not receive any notification that restricted funds would be moved to a general fund.” Since the policy changes are buried on the websites, I can understand how donors would feel this way. If Mercury One is serious about going in this direction, they need to alert all donors and display the changes where they can be easily seen. Furthermore, the reason for the change did not ring true. “The focus of our giving is to support humanitarian initiatives and that is why we could align with and completely support The Nazarene Fund. The statement that Mercury One made concerning donations will be made to one fund because it allows them to give funds more quickly/easily just doesn’t make sense,” claimed the former donors. These individuals said Mercury One portrayed their response to past disasters as being rapid. The donors did not recall any mention of this limitation in the past. Now that donations are not being taken for the Nazarene Fund, the former donors would like a financial accounting. They said, “Another concern we have is that to date we have not received nor have we seen financial accounting on the Nazarene Fund.” In fact, there is very little reporting about funds received and spent on the websites. Donors might be more confident in Mercury One if fund balances were published on the website. Overall, these donors expressed disappointment and confusion about the change of focus and the change in donation allocation. I have reached out to Mercury One via their website, email and Twitter without response. Other donors who wish to share their experiences should feel free to contact me. 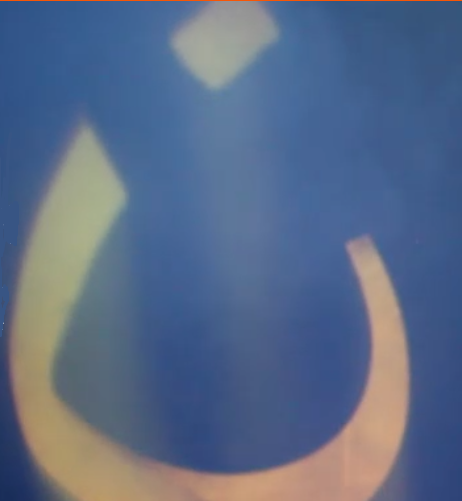 For several years, ISIS has invaded peaceful communities in the Middle East and painted the Nazarene symbol on the door of people they seek to convert, extort, or murder. 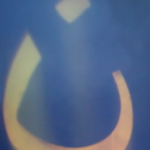 While ISIS uses the Nazarene sign to symbolize death, we use the sign to symbolize life. Mercury One is a US based humanitarian aid and education non-profit organization that established and administers The Nazarene Fund. The Nazarene Fund aids in the restoration of Christians and other persecuted religious minorities and their communities who have been targeted by ISIS for their faith. In 2014, the Christian community in Syria and Iraq were facing the greatest calamity in its 2000 year history. The Islamic State (ISIS), exploded out Raqqa, Syria, the capital of its self-proclaimed Islamic State. In a lightning strike that surprised the world, ISIS forces captured Mosul, Iraq’s second largest city) and all of the nearby Nineveh plain – the traditional homeland of the region’s Christian Community. What followed was campaign of extortion, murder and displacement not only of the Christians but of other ethnoreligious minorities in the region. By 2015 a population of 3 million people was reduced to 300,000 – most of them displaced from their homes and fleeing to other countries. In August of that year, Glenn Beck took the stage and the Restoring Unity rally in Birmingham, AL and declared the situation for what it was – genocide. Mercury One donors immediately responded and The Nazarene Fund was launched with a goal of rescuing 400 families. Second, Mercury One appears to be getting out of the refugee rescue business. According to the Nazarene Fund website, the need is not the same as it was in 2015. I am skeptical that the situation in Syria and elsewhere has improved to the degree implied here. In any case, donors should be aware that Mercury One doesn’t want to accept restricted donations, even for the Nazarene Fund, and going forward, won’t be focusing on rescuing religious minority families. Last week, Mercury One, founded by Glenn Beck, announced that all donations would be consolidated into one fund. In the past, Mercury One created various funds to accomplish specific goals. Donations to those funds (e.g., the Nazarene Fund for rescue of refugees) had to be spent on fund purposes. For instance, funds donated to rescue refugees could not be spent on purchasing historical artifacts. At the time, I took a skeptical view of the changes. In my opinion, charities are more accountable when donors can specify how their funds are to be used. In practice, I think a charity should have an all purpose fund as well as specific funds for specific needs. The balances in these funds should be known to the public. Mercury One stands for doing the right thing and throughout our five-year history, Mercury One has done just that. While the needs change from season to season, the constant is that Mercury One has been there to respond to those in need. We know that you, our family of supporters and donors, are vital to our mission. One of the reasons we have had so much success with our humanitarian projects and The Nazarene Fund is because people like you have trusted us to be effective and make a real difference in people’s lives. Thank you! If you have supported Mercury One in the past, or have followed our journey through Glenn Beck, you may know that for each need, we created a separate funding campaign so that we could allocate every penny of your gift to support each specific initiative. It has been amazing to see the outpouring of passion and support for these projects, but it also prohibited Mercury One from immediately distributing funds quickly when a new and urgent need arose. Beginning in March 2017, Mercury One is streamlining the way we receive and allocate donations. Going forward, all gifts will go directly to Mercury One. We want to be able to respond more swiftly, and to do this, we are consolidating future gifts (unless otherwise specified) to a single account so we can be more nimble and react immediately when a need arises. Donor intent is very important to us. Any restricted gift made to Mercury One has gone to support that specific cause. Mercury One has no intent of reallocating funds on any active funding campaign where the need still exists. For example, if you gave a restricted gift to Disaster Relief, to Veterans initiatives or to The Nazarene Fund, your gift will still be distributed to support that campaign. At any point, if a donor sends a restricted gift, Mercury One will honor the intent of the gift. If there are no projects that would fit that gift, then Mercury One will communicate directly with the donor and at the direction of him/her will either redirect the gift to another project or return the gift. We have been extremely honored to be able to partner with you, our donors, to make an impact in the world, whether it be to support disaster relief, veterans, those in crisis through our grant programs, or assisting Christians and other persecuted religious minorities in the Middle East. Our mission remains constant. We will continue to support humanitarian aid and education initiatives throughout our nation and the world. What is different, is that we will no longer raise funds for single projects nor for a General Fund to support daily operations. What stays the same is that Mercury One will continue to be conservative in our administrative spending and open with our hearts as we provide assistance to those in need. We thank you for your continued support and partnership in restoring the human spirit. Looks like a lawyer(s) got involved and crafted some language that is an improvement over the prior post. This approach seems more reasonable and transparent. Donors can submit gifts with instructions and if Mercury One can accommodate the donor’s intent, the charity will do so. If not, the money will be returned. All donations not otherwise designated will go to the general account for use as decided by the charity’s leaders. Last I checked Mercury One still had a link to the Nazarene Fund. Donors who want to give to that fund should ask what those funds will support. Furthermore, one should not assume that donations made from the Nazarene Fund website will go toward that purpose. 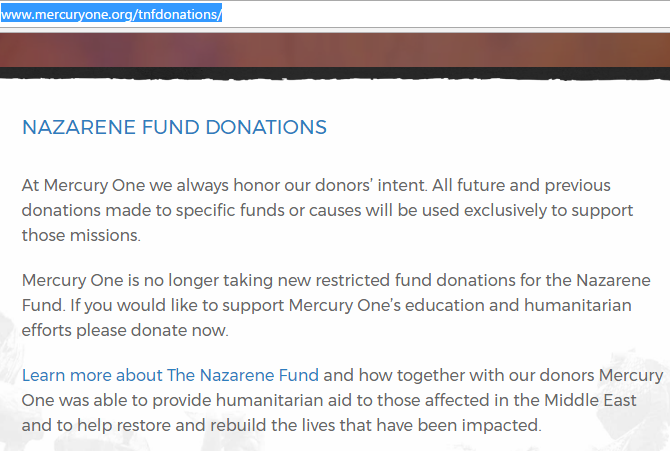 I still believe Mercury One should either remove that page or make it crystal clear (not buried in a blog post) on the front page that donations will only go to the purposes of the Nazarene Fund if the donor explicitly designates the gift for that purpose. A March 20 article in the Times of India puts focus on just how much money pours into India via the mega mission organization Gospel for Asia. A companion piece on Believers’ Church features K.P. Yohannan again saying he has no legal standing in any of his organizations. His own church Constitution seems to contradict this statement. According to the ToI article, Ayana Charitable Trust (Gospel for Asia’s new name in India) took in $126,376,000 (Rs 8.26 billion). Much of that came from Ayana’s Hong Kong bank accounts. Because of this infusion of cash from their Hong Kong bank, it is hard to know the impact of GFA’s fall from respectability over the past year. Believers’ Church recorded $128,824,000 in donations although $76.5 million came from “foreign funding from local sources.” While it is hard to know what this means in the case of Believers’ Church, presumably some of these funds are interest payments on the massive bank accounts owned by Believers’ Church. Since the Times article didn’t track all of the NGOs controlled by GFA, it is also possible that shell NGOs like Love India Ministries gave money to Believers’ Church which originally came from GFA in the U.S. or Canada. Combining the two mega charities, Gospel for Asia’s Indian partners declared $255,200,000 in revenues for FY 2016 alone. According to the articles, all of the entities affiliated with GFA and Believers’ Church have $366,735,000 just sitting in bank accounts. GFA founder K.P. Yohannan boasts of the outreach conducted by his group. However, with the funds available to them, GFA could do significantly more than they do now. Yohannan told the ToI that he does not head up any organizations. However, as I have reported before, Yohannan is the supreme authority over spiritual and temporal matters for Believers’ Church according to the church Constitution. He also heads the boards of at least some of the schools and the Bridge of Hope and is considered the benefactor of Believers’ Church Medical Center. In October of 2015, GFA’s membership in the Evangelical Council for Financial Accountability was revoked due to multiple infractions of ECFA’s financial standards. Notice the employer identification number: 22-3252844 (different than the number for Barton’s Wallbuilders Presentations). This is a federal identification number for a non-profit titled Wall Builders LLC. 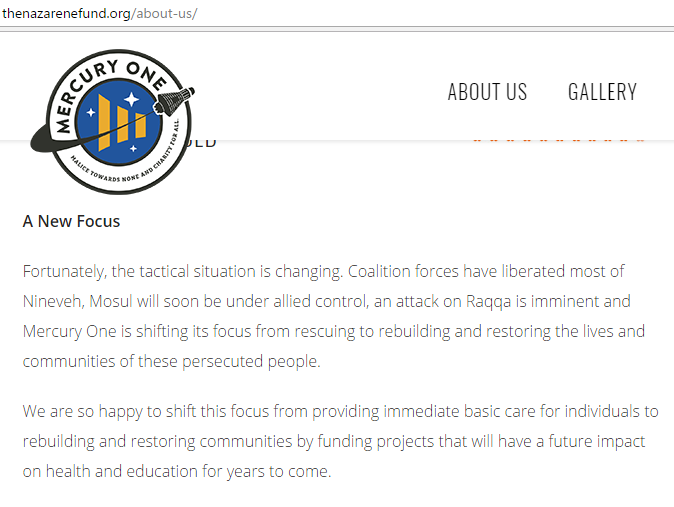 The address on the Mercury One’s website is the same as David Barton’s non-profit version of Wallbuilders Presentations. The first problem is that the gift is for “unforeseen disasters” which Wallbuilders has no obvious history of doing in a formal manner. The second problem is that the grant was given to a Wallbuilders which was inactive. 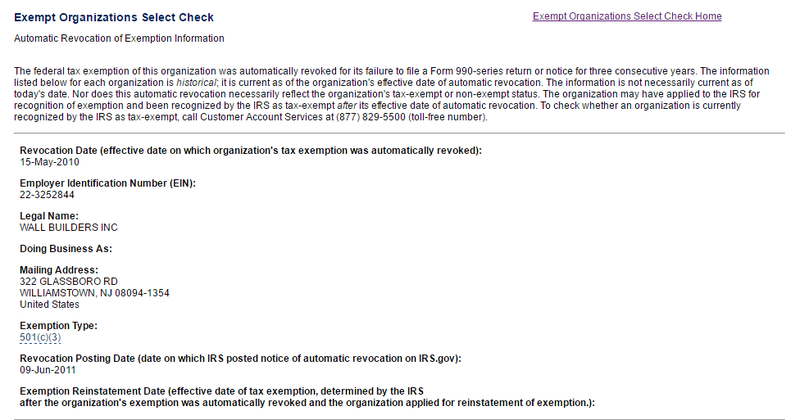 However, tracking the EIN at the IRS, I learned that this organization had its tax exempt status revoked in 2011. Oddly, the address is in NJ* and not Texas as it says on the 990. In any case, this organization appears to be inactive and is unable to accept donations on a tax exempt basis. Natural questions are: Where did those funds go and how were they used? *322 Glassboro Road in Williamstown, NJ doesn’t appear to be an actual address, but may reflect the fact that Glassboro Road is US Route 322. It isn’t clear why the addresses are different. I asked Mercury One for clarification on the grant to this Wall Builders but did not get a response. UPDATE: It is possible that the EIN is a mistake. Or perhaps Mercury One gave money to a Wall Builders in NJ (even though no one at the church knew about it when I called, there is one listed at St Matthews Baptist Church on Glassboro Road in Williamstown, NJ) but the wrong address was listed in the 990 form.